Home » Community » Nashville Symphony: Your Community. Your Orchestra. Nashville Symphony: Your Community. Your Orchestra. 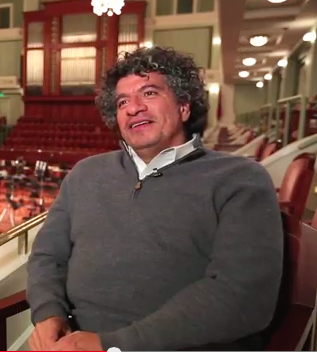 music director Giancarlo Guerrero speaks about the symphony’s role in the community in Nashville Symphony: Your Community. Your Orchestra. I’m pleased to be able to share with you the music education advocacy video that was produced by our Communications team and Mogulboys this Spring – it is now publicly available on Youtube (see below). The video has already been viewed by thousands of symphony patrons since the beginning of May, including screenings at the annual Fashion Show on May 5 and before our many movie concerts in the hall during the month of June. Nashville Symphony: Your Community. Your Orchestra features the symphony’s conductors and musicians both describing our organization’s commitment to music education as well as sharing personal anecdotes about the importance of music education in the life of the community. The four and a half minute video includes glimpses of many of the symphony’s educational programs such as our Nashville After Zone Alliance program, Is It a Fiddle or Violin?, One on a Part, Nashville Symphony musician-led Sectionals and Ensembles in the Schools, orchestra performances at a Pied Piper concert (including dancers from Nashville School of the Arts) and Classical Series concert, and moments with all three of the orchestra’s conductors: Giancarlo Guerrero, Vinay Parameswaran, and Kelly Corcoran. 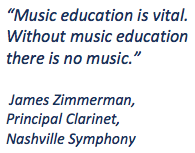 Perspectives on the importance of music education are also brought by several Nashville Symphony musicians, community stakeholders, and yours truly. By walterbitner in Community, Music Education, Nashville Symphony on June 26, 2015 .